Kilims are widely loved for their eye catching designs which enhance the look of spaces. Even the drabbest looking room can instantly turn into a lively haven when it meets the striking patterns and vivid color palettes of an exquisite Kilim rug. But more than what meets the eye, lies the true tale of beauty of Kilims. Below we explore the history of kilims and what makes these interior decors so special. We all heard of theKilim, but what are its roots? Originating from Turkey, Kilim refers to a pileless piece of hand woven textile that is produced using a flat weaving technique. This term is not limited to rugs alone as a Kilims are also used a wall decor, hangings, table covers, bed spreads, furniture coverings or upholstery and even for bags. It is widespread throughout Pakistan, Central Asia, China, Iran, Afghanistan, North Africa, Caucasus and the Balkans. A Kilim rug is a specific subset of flat weave or plain weave rugs. Flat weave rugs do not have piles and have a different feel compared to other rugs. Because they have no piles, they require less labor and materials to produce. In addition to that, a flat weave rug is also more affordable compared to hand knotted rugs. Its unique texture feels relaxing on barefoot, while its practical uses include being lightweight and can be easily moved in and out of an area or stored away when not in use. Maintenance is also not a problem because there are no piles which catch up dirt and dust and of course, there is no shedding. A flat weave rug considered to be of high quality because it is handmade. It is entirely different from a pile rug as the design in the pile in made visible through the use of short strands of different yarns that are knotted onto the lengthwise warps and held by tightly pressing the crosswise wefts together. Whereas in Kilims, both the warps and wefts are interwoven to each other in order to create a flat weave. 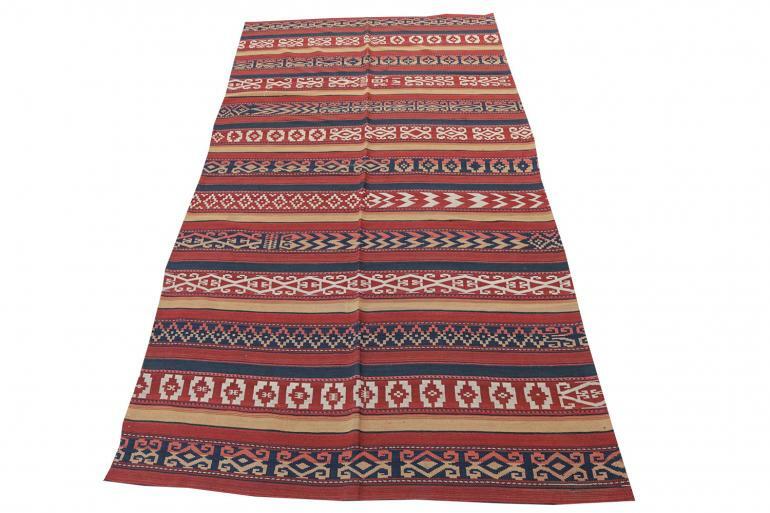 Bring warmth and coziness to your home with this exotic Afghani Kilim runner. Intricately woven using 100% pure wool and dyed with natural vegetable pigments, this traditional Kilim comes only with the best quality. The exotic blend of warm tones against a cream background are reminiscent of the colors of the sunrise, instantly radiating and bringing light to your home. The word “Kilim” originated from the Persian word “gelim”, which means “to spread roughly”. Kilim rugs originated in Turkey and dates back to the ancient times - during the eleventh century A.D. Although archaeological evidence proves that it exists as early as 7000 B.C with several Kilim woven textiles being recovered from Turkey. There is also recorded history of the existence of Kilims during the 13th century, where Marco Polo, the famous explorer, wrote of its great beauty. Its hand woven technique is said to be a tradition that came with the Turkmen Tribes as they migrated to parts of Iran, Turkey and Afghanistan. This makes Kilim one of the oldest design traditions in the world. Traditionally, a Kilim rug is not only used for interior decor. It is a popular dowry item given to brides and it is also used for religious purposes by serving as a prayer rug. But more than the practical functionality of Kilims, these rugs are a form of art which carries a piece of cultural heritage, tradition and self expression. Kilims are rich masterpieces, with deep symbolisms that are integrated within their patterns. This vintage Afghan flat weave Kilim rug showcases a stunning combination of geometric shapes and traditional motifs which reflect its place of origin. The combination of the color red and the color blue results to a perfect balance of warm and cool tones which make it visually interesting. With its versatile stripe pattern, this gorgeous Kilim can serve as decor for both traditional and contemporary interiors. Not only does it look good for your floor, it's perfect for your wall too. Distinct bold patterns and vivid myriads of color are what makes Kilims a stand out among other rug types. With motifs that range from geometric shapes, animals, plants and symbolisms of natural events or emotions. These stunning works of art may also use a combination of symbols with a unique blend of colors. But the real reason as to why Kilims are so distinguished is that beneath all the striking decor lies a deeper meaning. Kilim rugs are true masterpieces as each rug tells a different story. Traditionally, antique Kilim rugs are made by tribal women. The symbols woven within the rugs usually represents well wishes such as good health, fortune, protection from danger, good family relations or fertility. The “ebelinde” motif, for example, is a stylized figure of a woman which represents motherhood and fertility. A fetter motif or a “bukagi” is used if there is a desire to tie families together or to seal a bond between lovers. A wolf’s mouth and wolf’s foot motif or a “Kurt Aǧzi, Kurt İzi” expresses the desire for protection from harm. Hope for safety from the “evil eye” is symbolized by a hook “Çengel”, a cross symbol “Haç” or the eye “Göz”. For good luck and lasting happiness, a bird motif called “Kuş” and the star of Solomon’s seal “Yıldız” is used. Other Kilim rugs also possess amulets or a triangular symbol, known as the “Muska”, which contains a verse to speak of protection. In some cases, the oriental “yin yang” sign is also used to depict love. Kilim rugs are also a representation of artistic creativity and self expression. The maker can tell a story or evoke emotions through the designs in the rugs. The design is not limited and follows no strict rules, so it is guaranteed that each piece is unique. Kilims can also be considered as cultural treasures as they are a romantic reflection of history. It is an ancient heritage that is carried out through the years. 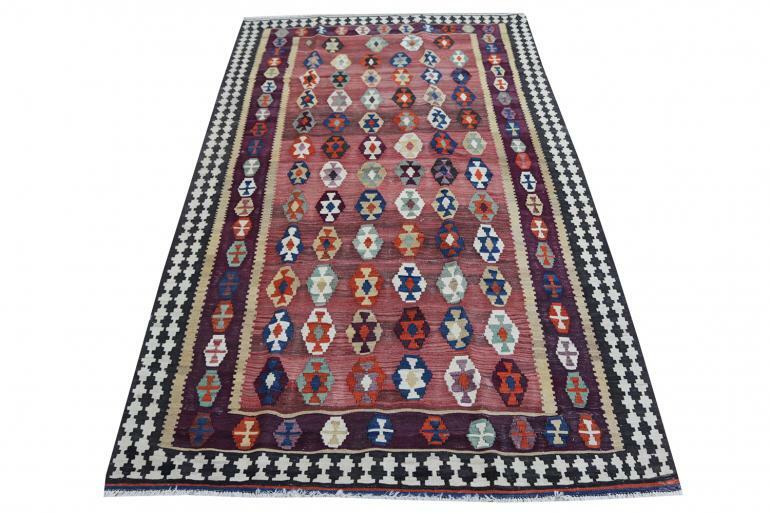 The use of fine materials give Kilims its distinct looks, stunning color and high quality. The primary material used for making a Kilim is wool. Most Kilim rugs make use of this material for both the warp and wefts, but in some cases it is mixed with cotton fibers too. Wool comes from sheep fleece and it has a natural strength and shine to it. The main reason as to why wool is popularly used is because it offers a lot of benefits. Wool is pliable, can be easily spun and it accepts color well. Aside from that, it is also widely abundant in regions where Kilim rugs are made. Just like wool, cotton is also abundant in most places that produce Kilim rugs. Cotton is a good material for rugs because it can easily be made into fine strands. These thin strands are usually used as warps and accents which are woven to highlight a pattern. Cotton also has a high strength that enables it to retain its shape even if subjected to everyday use. In some cases, animal hair is also used as accents for Kilim rugs. This includes camel hair, horse hair or goat hair. Goat hair has remarkable strength but it is rougher than wool, however “mohair” or Angora goat hair has a softer texture. Its inherent sheen gives a lustrous effect to rugs, making their designs more interesting. 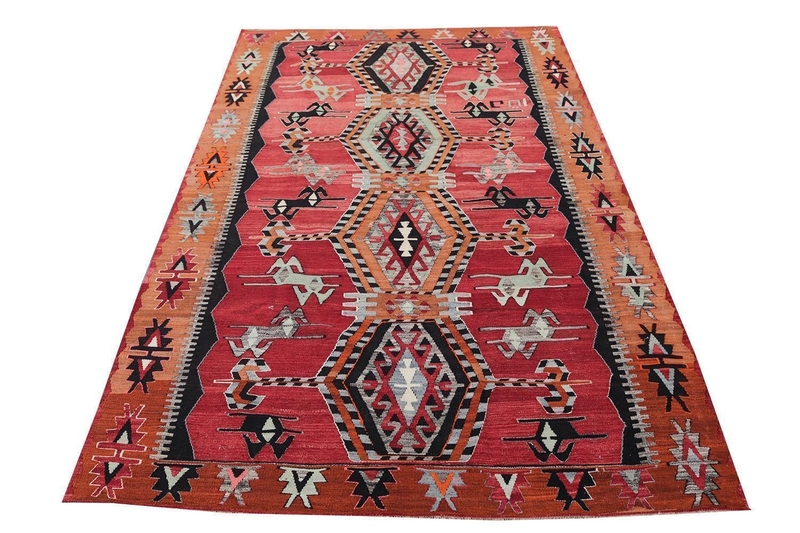 Camel hair is also durable and is primarily used to provide added strength to Kilims. Horse hair, on the other hand, are just mainly used for additional decor like tassels. Another material for Kilim rugs is silk. Silk is considered to be more luxurious than wool, cotton and animal hair. 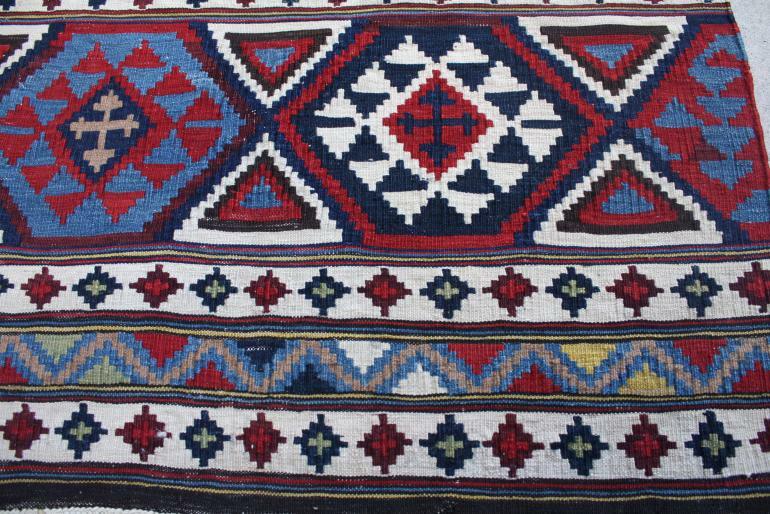 Out of all the materials, this is the rarest one of all and is only typically found in specialty Kilim which are traditionally used to reflect status symbols and bridal dowries. Silk kilim rugs are considered as a sign of abundant family wealth. This type of rug is produced in Anatolia, Turkey. Dyes give color to these threads and materials. In order to produce a high quality Kilim rug, natural dyes must be used as they do not wear off easily but once it fades, it tones down beautifully. This allows Kilim rugs to age gracefully and evolve with different colors throughout the years. Up close, the intricacy of the design of this antique Caucasian Kilim rug shows the amazing attention to detail and remarkable weaving technique used in creating this one of a kind work of art. You can see precision in terms of spacing and maximum creativity for the bold striking patterns and unique blend of colors. 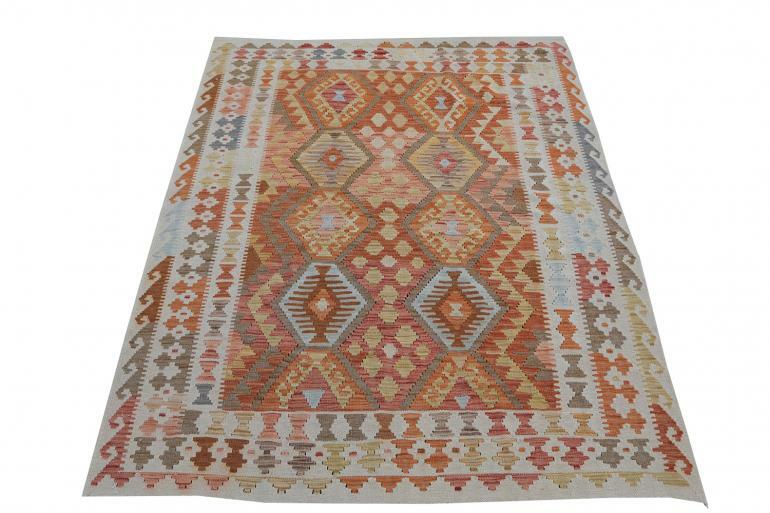 This striking Kilim rug can surely spruce up your living room. Unlike high pile rugs, a Kilim rug is commonly made by interweaving the warp (vertical yarns) and wefts (horizontal yarns) on looms, using traditional techniques which have been passed down from generations to generation. There are various forms of techniques used in making a Kilim rug. These flat woven rugs are hand knotted to perfection and are known for not having any piles. The patterns are created by integrating wefts of various color and interlacing them with warps of different colors. Among the different techniques, the weft faced plain weave is probably the simplest of all. In this technique, dyed weft threads are woven into warp threads to create a single block of color. This weaving technique creates a reversible design, with patterns similar on both sides of the rug. To create geometrical and diagonal patterns in Kilim, the slit weave technique is used. A slit pertains to the gap that is found between two colors. In order to weave two different color blocks together, the weft is returned around the last warp in a particular color block and then the weft of the adjacent color is later returned around the adjacent warp. The wefts are packed tightly to cover the warps to ensure that the rug does not slit. The methodology requires completing a particular color block first before proceeding to the next. This results to bold patterns which are reversible. Compared to other rugs, the front and the back portion of the Kilim are the same. Traditional tools used to make Kilim rugs include a beating comb, scissors and a loom. The loom is an ancient weaving invention that dates back to 4000 B.C. The loom is used to hold the warps (lengthwise yarns) in place, while the weft (crosswise yarns) are intricately woven in between them. The beating comb, on the other hand, is a piece of wood, metal or bone that resembles a comb and has the primary purpose of “beating down” the wefts together. This ensure that the rug is tightly woven. Making a Kilim rug is quite laborious and entails a perfect skill. The average time to complete a 6 feet x 9 feet piece is 12 to 16 weeks, depending on the complexity of the design. 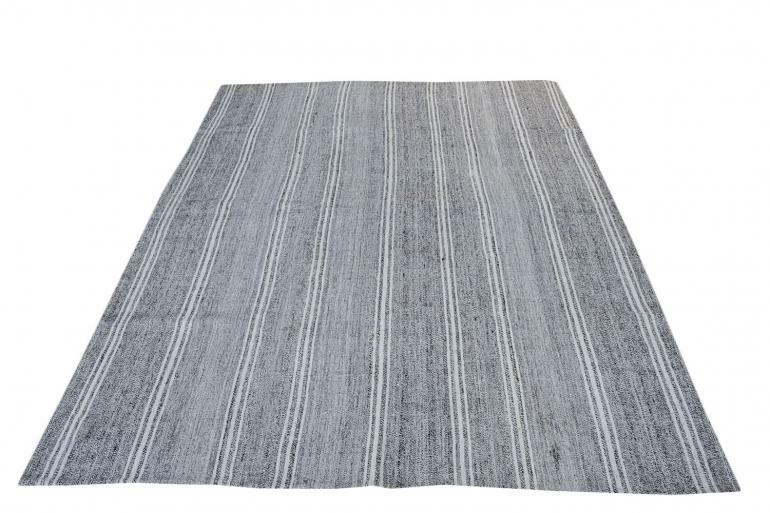 The simple pattern of this vintage Turkish flat weave rug is a much modern take on the classic Kilim. Traditionally, Kilims are heavy on prints and motifs, but this particular design showcases a subtle striped pattern which is perfect for contemporary settings and modern homes. The cool gray color of this vintage Kilim also lends a quiet strength to spaces, bringing statement without being too overpowering. This is perfect for homeowners who do not want to commit to the intensity of vivid colors and bright patterns of a traditional Kilim, but love the feel of a flat weave rug. There are a number of reasons as to why Kilims are special. Aside from their distinct visual aesthetics, Kilim rugs possess other positive attributes which make them a wise investment for your home. Kilims are versatile. The use of a Kilim rug is not limited to being a decor for the flooring. It can be hang on the wall as a beautiful artwork, or used as an upholstery material for a sensational accent chair. No matter how you choose to set up your Kilim, it will surely bring your room to life instantly. The design possibilities that a Kilim rug offers are endless. With the wide variety of colors and patterns to choose from, incorporating it in interiors is a breeze. It can be used in a variety of room settings, regardless of the prevailing style of your home, whether it may be classic or traditional inspired. This type of rug are highly suitable for eclectic themes as they bring the perfect mix of visual aesthetics and character. They work well in modern interiors by functioning as accent pieces for a minimalist space and they also blend with classic flair of a traditional home. They can be used as focal points for a space or as complementary interior decors that tie a design cohesively. It is an effective way to ground furniture pieces, to introduce a pop of color, to bring texture and pattern or to add energy to a space. Kilims are timeless. Kilims rugs are proven to stand the test of time. They may be traditional, but they never go out of style. Even if the style of your home switches, a high quality Kilim rug will be able to adapt to the interior. Kilims are evolving. As Kilims become one of the most sought after rugs for interior decor, its patterns also began to evolve into more contemporary versions. Its geometric prints are toned down to more subdued colors. These modern kilims possess the same flat weave texture and undergo the same traditional technique, but their designs are more abstract and geared towards a contemporary vibe. Bring home a piece of history with you with our unique selection of Kilim and Flat Weave rugs here at The Rug Warehouse.